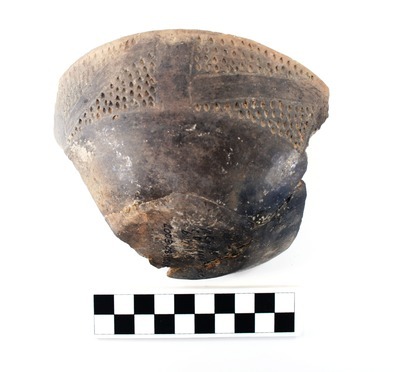 "41HS269, 2003.08.1081, Burial 8" by Timothy K. Perttula and Robert Z. Selden Jr.
DECORATION (INCLUDING MOTIF AND ELEMENTS WHEN APPARENT): The rim panel has an incised continuous scroll motif. The upper and lower scroll fill zones are filled with small circular tool punctations. There is also a single horizontal engraved line on the vessel’s interior surface at the carination. Pennington Punctated-Incised carinated bowl rim sherd, Burial 8, C. D. Marsh site.